In the years before Toronto became a legitimately dense city, there were a handful of country-like resorts spread around the metropolitan area. The Inn on the Park is probably the best known of these lost pastoral properties, but the Guild Inn in Scarborough was surely the most beautiful in terms of the landscape and setting. The Inn actually started as the country estate of Colonel Harold C. Bickford (after whom Bickford Park is named) all the way back in 1914. He would eventually sell the house in 1921 after which it changed hands a few times before being purchased in 1932 by Rosa Breithaupt Hewetson who had plans to turn the property into an artist colony with her husband Herbert Spencer Clark. It took a few years for the The Guild of All Arts to take off, but by the late 1930s the property had become popular enough that the Clarks built a number of additions. They moved out of the main residence and added dormitories to house even more artists and craftspeople. Some of the land was also planted with crops and a handful of livestock were kept to provide food for the residents. In other words, it was an idyll: a gorgeous lakeside setting where life was devoted to the pleasure of making things through traditional methods. The hustle and bustle of downtown Toronto was only a half an hour away, but the two worlds couldn't have been further apart. During World War II, the Guild of All Arts temporarily became a training centre for the Women's Royal Naval Service but it was returned to the Clark's management in 1947. 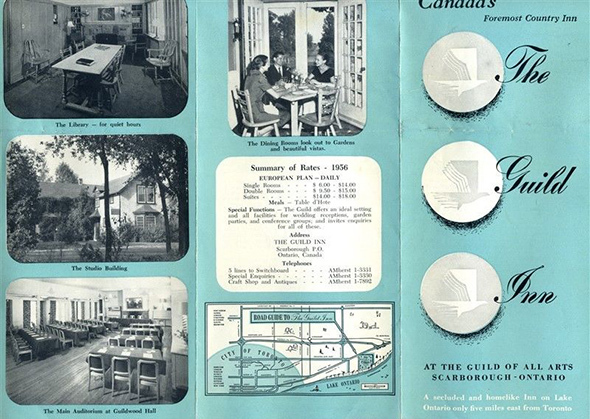 This was a period of profound change in Scarborough and also for the Guild. The post-war boom led to the rise of suburbs like Guildwood Village, which was built on a swath of land orignally owned by the Clarks. The major building boom was going on downtown, though. As modern skyscrapers like the TD Centre rose in the 1960s, historically important buildings were being demolished with little thought of preservation. It was during this period that the Clarks started acquiring fragments of architectural monuments to keep on the grounds, a collection which remains on display today. 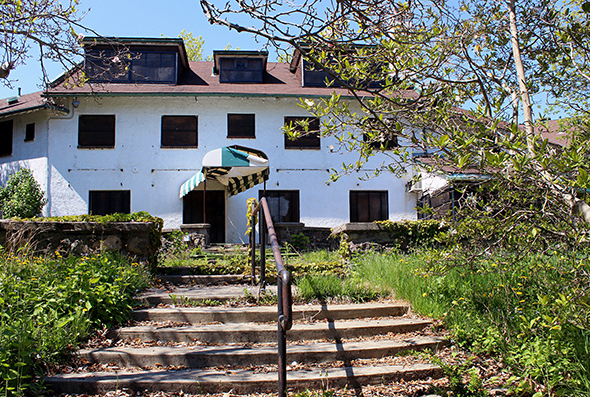 During this period, the Guild Inn transitioned from a fully fledged artist colony to a functional lakeside resort, a process that was capped by the construction of a six storey hotel tower in 1965. This structure was often maligned as anachronistic on the old country estate, though its rounded balconies were full of mid century charm. The Inn was a wildly popular place for inner-city vacations, weddings, and events through the late 1960s and the early 1970s. This was a time when Scarborough's motel culture was still strong, and the area hosted thousands of tourists and vacationers each year. But it was the beginning of the end for all of it. Remember, the Clarks acquired the Guild Inn property in 1932. As they reached advanced years, they wanted to ensure that legacy of the property was secure. 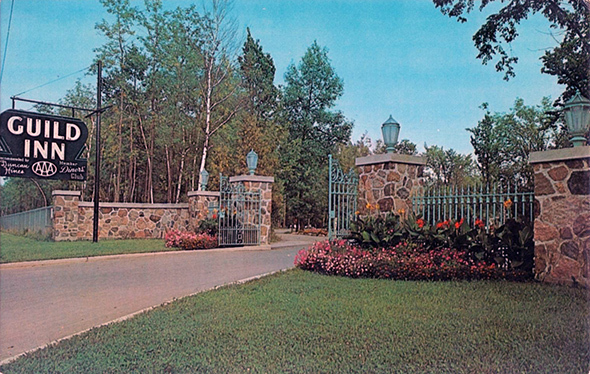 So in 1978, the Guild Inn and grounds were sold to the city of Toronto to the tune of $8 million with a clause that the Clarks would continue to operate the Inn for five years. Following 1983, troubles at the Guild Inn were demonstrated by the number of times the resort changed management. It was still a popular place, but its age was starting to show and there was something missing without the care and pride the Clarks put into the place. 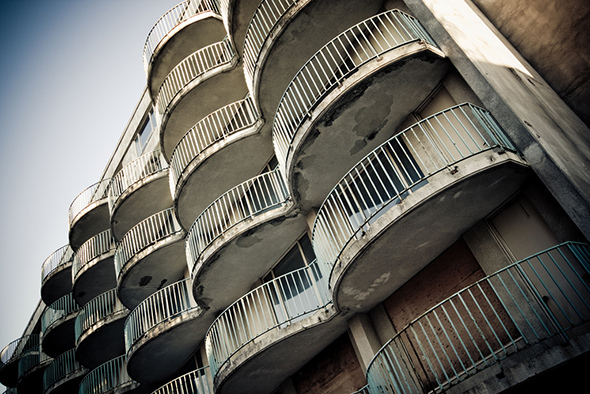 By the late 1990s, the initial vision for the place was crumbling along with the buildings. The grounds were as gorgeous as ever and the architectural garden was well maintained, but the Inn has lost its reputation as the city had grown up around it. 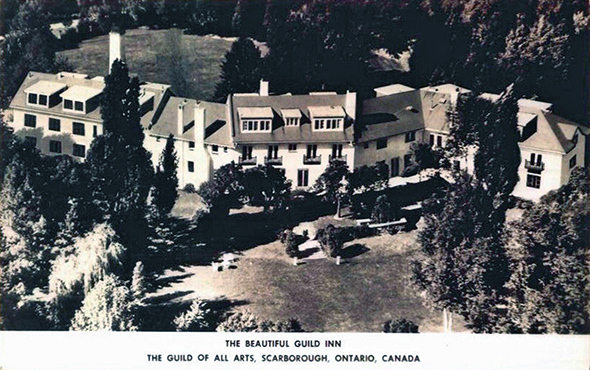 Shortly after Scarborough amalgamated with Toronto as part of the megacity, the Guild Inn was closed and left to decay. The value of the property was never in doubt, however. Even prior to closing, numerous proposal for the site were made, some of which don't sit well with the surrounding community. After years and years without resolution or a suitable deal being found, it was finally announced in late November of 2015 that the Guild Inn would return. It won't be a hotel this time around, but plans to turn the property into an event venue will include the heritage preservation of a number of key elements. 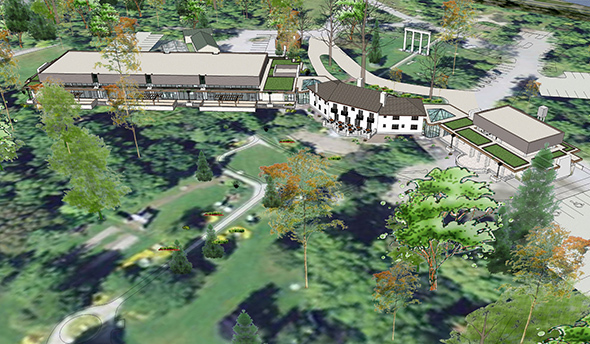 In fact, we might see part of the site operational as early as next year. 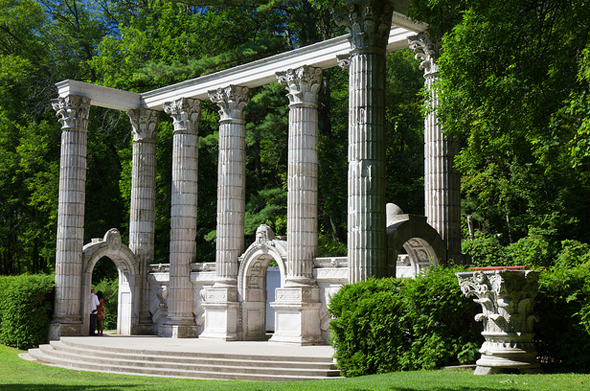 The future of the Guild Inn won't be as alluring as its remarkable past, but it's reassuring to know that it will have a future as a place that designed to bring people together and that maintains some of the site's history. It's one of Toronto's truly special places and the best way to honour the Clarks' legacy is to keep the property as a place that draws visitors to experience its beauty. Photos via Ebay, dtsuff9, Ilia Alshanetsky, and the Guild Inn.